Conheça as duas atrações mais famosas do Rio, o Pão de Açúcar e a estátua do Cristo Redentor, durante este passeio privado. Com o seu próprio guia dedicado e sedan executivo privado, viaje diretamente do seu hotel para estes dois sites em privacidade. Duração do passeio e itinerário são flexíveis; Aproveite a atenção personalizada que vem com um tour privado. Se você tiver pouco tempo no Rio, aproveite ao máximo com essa opção que economiza tempo. We booked a private tour to see Sugar Loaf and Christ the Redeemer and I would rate this as one of the best tours. We had Leo as our guide, we were able to move through crowds quickly, he knew the best spots for pictures and having a nice air conditioned cool car waiting for us was so worth it! Leonardo our guide/driver, was really great and very informative. Christ the Redeemer was an amazing spectacle and a must see as is Sugar Loaf. It all seemed a bit chaotic at the sites, but eventually worked well as we began to understand how it flowed. Leonardo was contactable after each visit, and was back within minutes to collect us. A very enjoyable day. This was a great tour with H the most amazing tour guide who was so informative and made everything so interesting. We enjoyed it so much we booked another private tour to the favela the following day and this tour was even better. I would highly recommend. We had been to so many trips and this tour is one of our best. Andrea, our tour guide, was excellent in all categories.which was a big factor in our wonderful and amazing experience.. She was not only knowledgeable but very personable . She volunteered to take all our pictures and went over and beyond by using her own i--phone when we had problem with our own and sent the pictures to us by e-mail. She was flexible with her time and catered to our personal needs and wish like shopping time,rest time , and refreshment time. 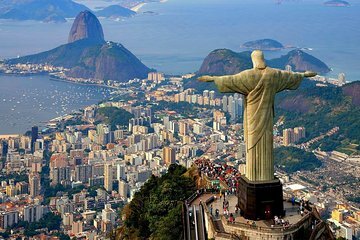 The Sugar Loaf and Christ the Redeemer is a Tour never to miss to South America trip. and very highly recommended. We felt so blessed with beautiful weather, knowledgeable and very kind tour guide and the opportunity to experience and enjoy the place.Very highly recommended. Guy is very knowledgeable and accommodating to our wishes. His command of the English language is amazing! He made our first and probably only trip to Rio a most wonderful experience. Thank you Guy! What a great tour, a must see if you go to Rio. Very good tour guide and well organised. Because of time constraints due to our delayed flight we were unable to get to see Christ The Redeemer Statue or experience the tour in-full, but we did get to visit Sugar Loaf Mountain. Our tour guide was very helpful and told us all about the mountain and traveled with us to the top of both mountains. The lines for the tram were long but they did more rather quickly. The views from the top are incredible. If the weather is clear you can see all different parts of the city of Rio including the Redeemer statue. At the top there are adequate restroom facilities as well as restaurants where you can sit down, refresh yourself and enjoy a drink or a bite to eat. Had great experience with Brummie Lines. Got picked up in one of those Dodge/MBZ Sprinter vans which was spacious and clean. The driver was very skilled manipulating the narrow and crowded hills of Corcovado. Our guide was the owner, Raphael, who was very friendly and knowlegeable about not just the sights but how to minimize wait times and crowds. Definitely very flexible with the itinerary and schedule which we appreciate. Fantastic! We had 2 guides and a driver who were all great......knowledgeable and friendly. This is definitely the way to see these very busy sites.......avoiding transportation snarls and long lines. It was over 100 degrees and we were traveling in air-conditioned comfort., with guides always checking to see if we needed water, showing us where restrooms were, etc. perfect!